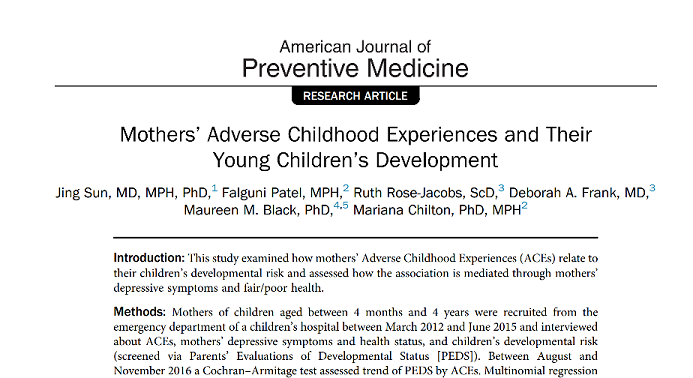 This study examined how mothers’ Adverse Childhood Experiences (ACEs) relate to their children’s developmental risk and assessed how the association is mediated through mothers’ depressive symptoms and fair/poor health. Mothers of children aged between 4 months and 4 years were recruited from the emergency department of a children’s hospital between March 2012 and June 2015 and interviewed about ACEs, mothers’ depressive symptoms and health status, and children’s developmental risk (screened via Parents’ Evaluations of Developmental Status [PEDS]). Between August and November 2016 a Cochran–Armitage test assessed trend of PEDS by ACEs. Multinomial regression models examined differences in PEDS by ACEs severity. Mediation by mothers’ depressive symptoms and self-rated health was also assessed. Of 1,293 mothers, 56.7% reported one or more ACEs. Mothers also reported developmental risk (20.4% overall): 120 (9.2%) reported one concern and 144 (11.2%) reported two or more concerns on the PEDS. Mothers who reported household substance use, mental illness, or an incarcerated household member during childhood were more likely to report at least one child developmental concern on the PEDS. After controlling for covariates, odds of one PEDS concern were 1.86 (95% CI=1.16, 3.00) for ACEs, one to three versus none, and 2.21 (95% CI=1.26, 3.87) for ACEs four or more versus none. Adjusted odds of two or more concerns were 1.70 (95% CI=1.07, 2.72) for ACEs, one to three versus none, and 1.76 (95% CI=1.02, 3.05) for ACEs, four or more versus none. Mothers’ depressive symptoms and self-rated health were potential mediators. 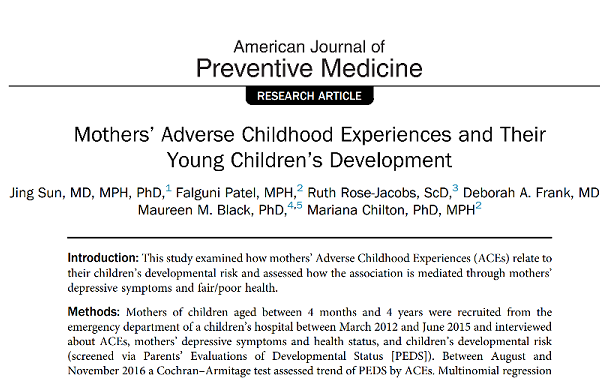 Mothers’ ACEs are significantly associated with their children’s developmental risk. If replicated, findings suggest that addressing intergenerational trauma through focus on childhood adversity among young children’s caregivers may promote child development.